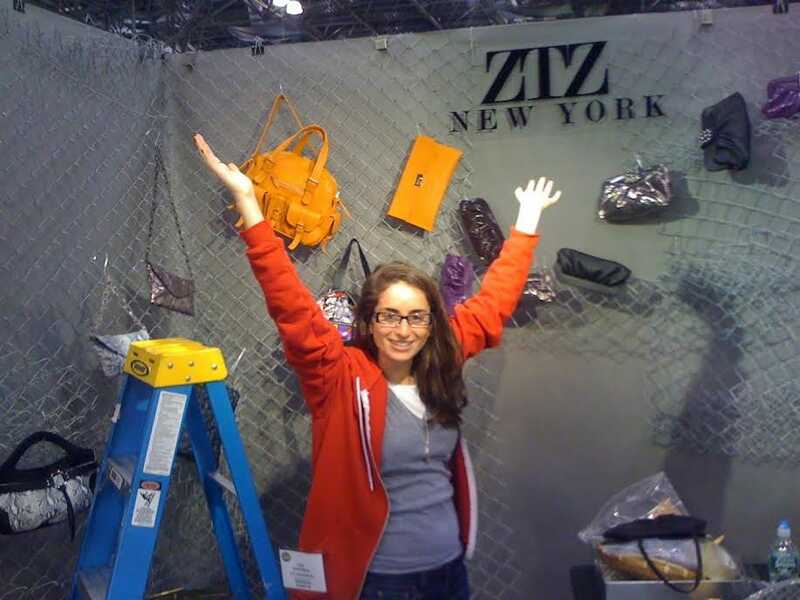 Zara TerezZara Terez peddling her leather bags at a trade show in 2011. Zara Terez remembers being at a trade show in 2011, peddling her beautiful custom-made leather bags to retailers. A mix of “uptown classic meets downtown fun,” as she told us, the bags were made of genuine leather and had all the makings of a luxury accessory. Terez left her signature mark inside the bags with — fun prints on stretchy scuba material lined each piece. She was hoping to catch the eye of a buyer and get her goods in store windows. It worked, but not according to plan. Sitting near the handbags was a box of the scuba material lining, all showcasing the various prints — spaceships and city skylines — and that’s what the buyers were interested in. Over the next several months, she ditched the bags, and began to manufacture leggings out of the scuba material (scuba is stretchy, so it’s perfect for that kind of stuff.) 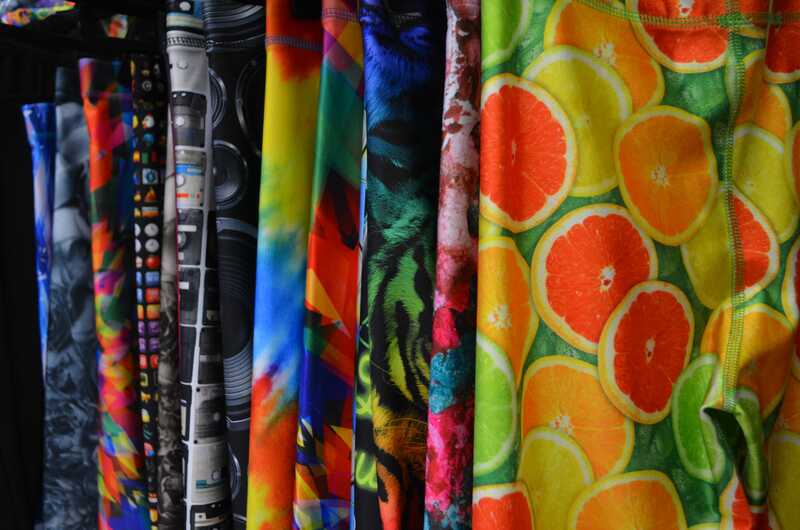 The leggings had crazy, colourful, designs on them. Terez, who comes from a family of people that work in the garment industry, partnered up with her best friend Amanda Schabes, who still works with her today in their Manhattan headquarters as creative director. Caroline Moss/Business InsiderA sampling of leggings from Zara Terez. But the funky leggings weren’t for everyone. It was hard, Zara remembers, to convince big department stores and small boutiques that the apparel, priced at $US78 a pop (not cheap! ), would sell to consumers. 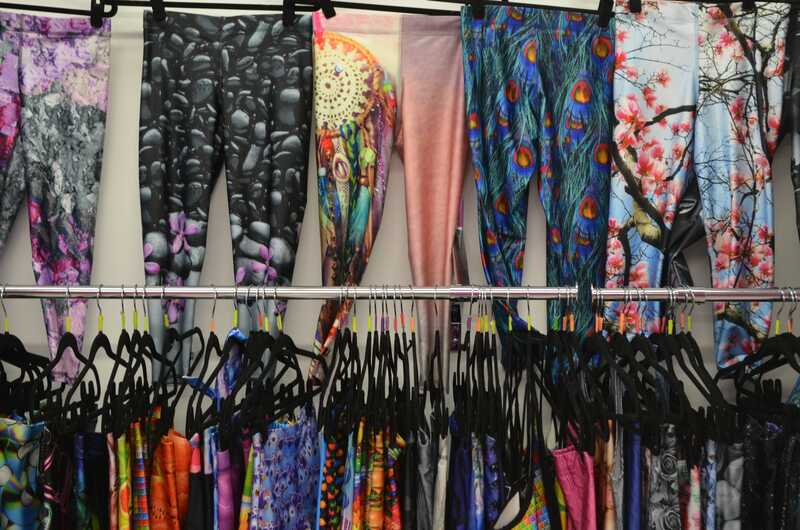 The stores weren’t sure that if they stocked the leggings, they’d actually make money off of them. Zara Terez was turned down right and left. Store owners and buyers were too apprehensive. So Terez turned to a free outlet to get the word out on her brand to a big audience: Instagram. And she reached an unlikely audience: very young girls. In fact, it was 9-year-olds who were the first to pick up on what Zara Terez was doing. Her first line — leggings with stars, constellations, and planets — were trendy amongst young pre-teen girls back in late 2012 after the company picked up a following on social media. 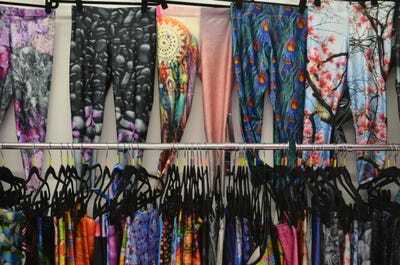 The company — which didn’t have a social media professional working for them, it was simply Schabes and Terez — began posting photos of the leggings and sharing them on Instagram. People would tag their friends (that’s Instagram-speak for “look at this!”) in the comments, and Zara Terez began to grow a following. This photo is from two weeks ago, but it shows the kind of power Instagram gave this company. 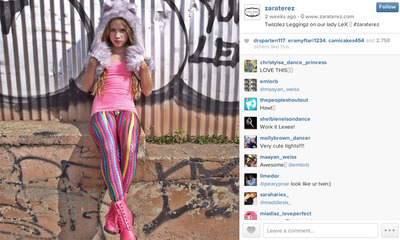 Zara Terez InstagramZara Terez built a huge following on Instagram. Fans started going to stores and asking for the product. Then, something great happened. Kids started telling their parents about the leggings they were seeing on Instagram, but they couldn’t find the leggings anywhere except for the Zara Terez website. 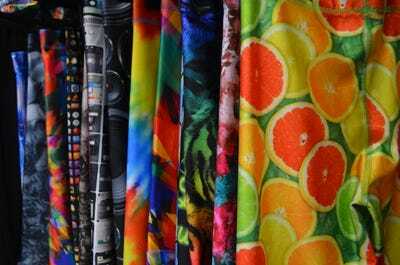 Parents would go into boutiques and department stores asking if they carried Zara Terez Galaxy Leggings. Then, the stores started calling Terez, as she remembers. “They were like, ‘yeah, ok. We get it now,'” she recalls with a smile. Terez, who is married to TechStars founder David Tisch, also works with her sister. Her mum, Terez told us, was always her number one fan. When Zara was 22 and declared she wanted to start her own line of handbags, her mum was the first person to applaud her ambition. 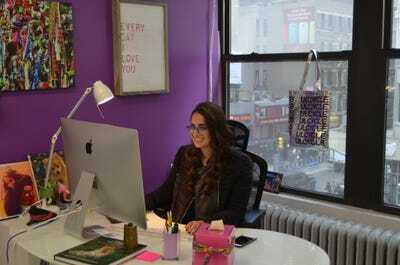 Caroline Moss/Business InsiderZara works from her Manhattan office, located in the garment district. Terez is bubbly and welcoming and kind. She is committed to her work and her dozen or so employees and the young girls and women that buy her apparel. The company recently paired with King to create a Candy Crush line. They teamed up with Soul Cycle to create a fitness line dubbed “Respect the Sweat.” We asked for financial information but Zara Terez declined to provide it. She cited exponential growth and said she’s excited about the future. She’s massively popular with the pre-teen and teen crowd. To be crowned as “cool” by that demographic is no easy feat. Everything is done, from the creation to the manufacturing to the shipping, in the New York headquarters. Her popular “crushed makeup” leggings were designed when the Zara Terez team took a photo of eyeshadows — greens and pinks — all crushed up. Then the photo was transferred to the scuba material. Terez says that’s how all of the leggings are created. All of their designs come from either original photos they have taken themselves or from images they have purchased the rights to on stock photography sites. They need very high-res, high-quality images to produce their designs, so they either need to shoot these themselves, or buy professional photographs with high resolutions that they can then manipulate them into images that will look great on leggings. Now the apparel line is in Saks and Nordstrom, as well as smaller clothing stores all around the country, but Instagram remains a huge part in the success of the company. They have 117,000 followers, a massive following compared to a modest 2k or so on Twitter, and if you look at the photos other people tag @ZaraTerez in, you’ll see that a few dozen come in a day. Mostly it’s of young girls wearing the leggings, and you hardly ever see the same design twice. But perhaps it’s the message of inclusivity that keeps her customers coming back for more. 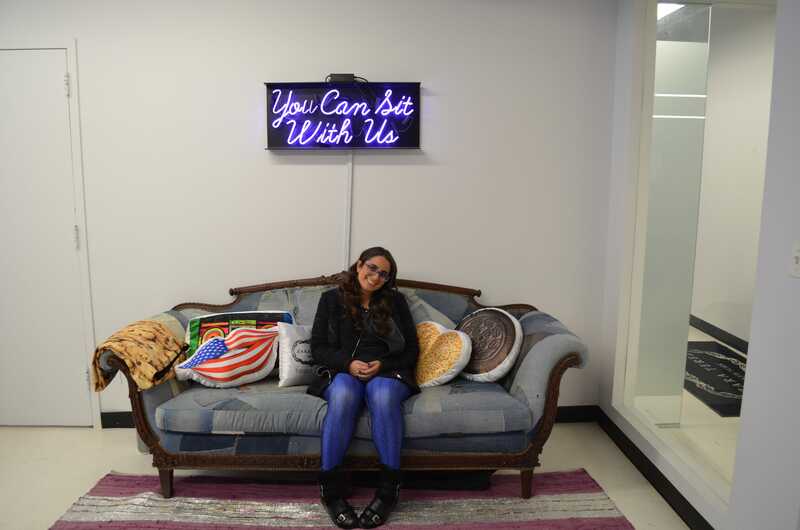 In fact, a huge sign rests above a funky love seat; “You can sit with us,” it reads, a play on a popular quote from “Mean Girls” that declares the opposite. A message young girls may need to hear more often.